Swimming with wild dolphins, dolphin watching and dolphin encounter are some of the best holiday experiences that make Mauritius one of the exceptional holiday destinations around the world. The friendly sea mammals are playful and love being pampered. So long as you do not cross their line and stick to the safety rules given by the event organizers you will have a trouble-free encounter with these intelligent aquatic animals. You can easily swim with the wild dolphins or interact with them in their native marine environment. Have you thought of swimming with unique, wild and intelligent sea mammals in a natural habitat? Yes, it is possible in Mauritius. Not all spots are the best locations to swim with the dolphins. To get access to an excellent place you require experts who have the precise information and skills to guide you more so if it is your first time. 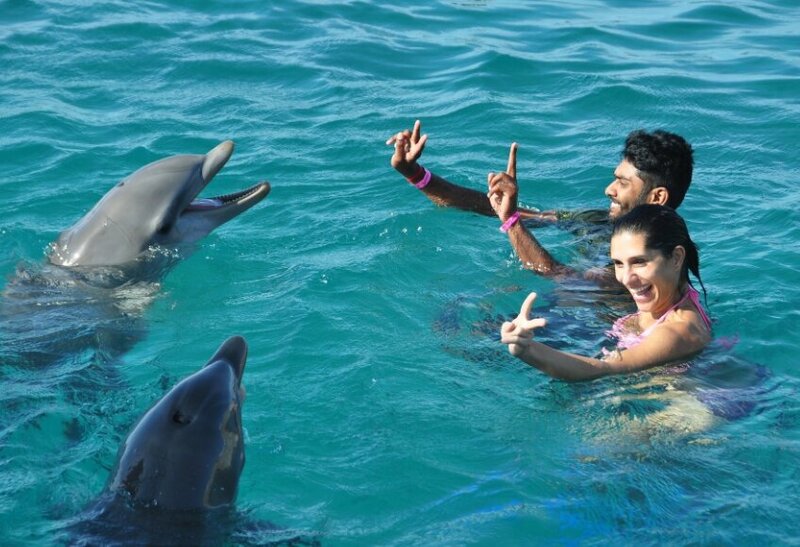 It is a one of its kind experience swimming with the dolphins in the Indian Ocean. Mauritius offers an exciting environment to swim with the most friendly sea mammals. Before swimming with them, the skippers will give you comprehensive information on how to have the best swimming sessions that are free of hitches. It is possible to have a beautiful underwater experience as you swim along with the dolphins guided by the skippers. The skippers will not only teach how to swim with the bottle-nose dolphins but competently guide you to have a friendly mingling with the mammals in the natural habitat as you enjoy the swimming sessions. Can you swim with dolphin while pregnant? West coast is the best spot to swim with the wild dolphins as you will find them in the best mood after having a deep sea feeding spree. Dolphins’ intelligence is profound as they can quickly detect a mother to be and get closer to them. These marine human friends love pregnant women and would like to swim, play and socialize with them. This occurrence though momentous for expectant mothers must be under the watch of experienced skippers. They will ensure that the swimmer is not flocked by excited pods of dolphin that might end up being catastrophic. Snorkeling with spinner dolphins in the Mauritius open sea is a memorable activity that you would not want to miss. This underwater exercise is breathtaking and will capture your imagination as you have a meaningful and playful engagement with affable marine beings in pods. Swimming or snorkeling with the dolphins in their habitat will make your holiday experience memorable more so when you have the best photos or images captured while swimming along with the dolphins on the crystal clear blue ocean water. The best to have an encounter with the dolphins is at dawn that is the time they return to their natural habitat after hunting the entire night. It is beautiful scenery to watch as you will stumble upon some of the rarest and beautiful species of these intelligent sea animals. Depending on your location you will be able to see bottle-nose dolphins, the famous Mauritius black dolphins, spinner dolphins among other wild dolphin species in Mauritius. Before you embark on the trip, the adventure organizers will take through the safety briefing and educate you on the species of the dolphins and how to handle them. They inform you on the best swimming tips that will make your encounter with the dolphins a fruitful exercise. After the briefing, the search begins cruised with a speed board or dolphin catamaran that will ferry you to some of the best spots to watch and play around with these magnificent sociable marine mammals. Experienced skippers will ensure that you have the best moment by guiding you since wild dolphins interactions require tact to have the best exchanges with them. You do not need to scare them, but you have to create a tranquil environment for them to be domiciled and friendly. It is possible to have an underwater close moment with the dolphins, but it is not advisable to touch them as that might scare them and make them take a flight which is not safe. They have been funny behavior reported about the dolphins that you must be aware of more so when they are stressed. Though not aggressive it is advisable to avoid annoying or to make them hostile by immoral behaviours. Can you feed the dolphins? You might want to feed the dolphins, which is okay but you must consult with your guide since feeding the mammals in their natural habitats is outlawed. They are other strict rules that you must be aware of and adhere to as they are meant to protect the sea animals. Be mindful not interfere with the natural habitat of the dolphins. It would help if you also avoid making noise to attract them, swimming or accessing the nurseries without permission, touching or using an object to poke them to get their attention. The excursion boat must at all time be on neutral gear when approaching restricted dolphin areas. However, these rules will not dampen your encounter but will ensure that the dolphins have a good treatment. You should, therefore, deal with licensed and trained skippers who are aware of these regulations to have a superb dolphin excursion in the expansive Mauritius marine world. One of the best places to watch dolphins is around the Tamarin Bay on the west coast Mauritius. If you want an exciting interaction, you will have to cruise into the sea and get the most excellent view of dolphin’s acrobatic display. Under the direction of the experienced skippers, you will have an opportunity to dive into the water and swim with a dolphin. The Flic en Flac coastal line is excellent to enjoy swimming with dolphins and watching these highly intelligent and sociable sea mammals. To get the best moment in this delightful aquatic scene to reach out the organizers so that they can arrange an all-inclusive oceanic excursion that will enable to have fun with the dolphins. Mauritius is one of the leading tourist destinations across the globe that has much to offer. To get the best experiences and value for your money ensure that you get the best trip organizers and excursions experts that will make your holiday memorable and worthwhile. The aquatic adventures such as watching the dolphin, swimming or snorkeling with the dolphins require adequate preparation and ought to be handled by highly skilled skippers who are familiar with the sea mammals’ habitat. The right choice of skippers will ensure that a high level of safety be given without making your trip a boring one. They will make your marine excursions and adventures fantastic and unfathomable. The two common dolphins that you will come across while on an excursion in Mauritius waters are the Spinner and Bottle nose Dolphins. Spinner dolphins are dark grey, and they have dark patches in their back, tail, and throat. They also have a thin protruded beak that has a tip which is dark. Some of this unique species of dolphins have creamy white patches on their belly. Adult dolphins averagely weight between 22kg and 80kg and most of them are between 130cm and 237cm. Spinners live for an extended period and mature into adult between four and seven years for females and seven and ten years for their male counterparts. Spinners are magnificent swimmers and friendly, and you will enjoy swimming along with them as they are great acrobats and spinners. For those who love to watch creative dolphin moves, the spinners will make exhilarating swift spinning jumps. They are also keen bow-riders and assemble in high numbers before they get on an incredible acrobatic display. Bottle-nose dolphins are grey and is frequently spotted in several spots in Mauritius. They love warm, pleasant sea waters, and that explains why you will be able to find them on the Mauritius sea waters. They are two to 4 meters long and weigh between 150 and 655 Kilograms. They have stretched out snout looking similar to a bottle. It is critical to note that its actual nose is the blowhole that is on the top of the dolphin’s head. These oceanic dolphins live in pods that consist of 15 mature dolphins. They like hunting in a large group, but at times you will be able to come across some hunting as individuals. Bottle nose dolphins have an extended lifespan that goes up to 50 years and above. They are friendly and work closely with Mauritius fisherman in their fishing or hunting expedition. They drive fish in droves to the shore to the advantage of the fishermen and also to their benefit.